What Is the Story of Wit? 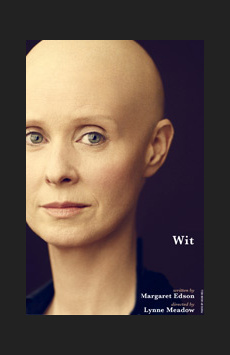 Wit centers on Vivian Bearing, a brilliant and seemingly unemotional poetry professor as she undergoes an experimental and extremely aggressive chemotherapy treatment for metastatic Stage IV ovarian cancer. A scholar who devoted her life to mastering the Holy Sonnets of John Donne, she must now face the irony and injustice of becoming the subject of research. As Vivian undergoes treatment at the hands of impersonal doctors (including one of her former students), she discovers that human compassion may be more important than intellectual wit. More than a play about cancer, Margaret Edson’s 1999 Pulitzer Prize-winning drama presents a teacher becoming a student of life as she contemplates her possible death.